Riveting! I sat down to read this in the morning and finished the book before bedtime. It is absolutely amazing to me the temerity and lack of morals that some people have. This book explores and exposes those types of people. The Setup is an appropriate title as there are multiple set-ups within. The first is the set-up that begins the unravelling of a personal kingdom. Chris Butler ran a Private Investigation business, but supposedly a business with a bit of a twist…his PI’s were ‘soccer moms.’ So innovative was this idea that Butler was working on a television deal for a ‘reality’ show of his soccer-mom-PI’s. They’d been featured in People magazine and guests on the Dr. Phil show, and had hoped to gain a little publicity from a Bay-area magazine Diablo. Butler invited Diablo writer, Pete Crooks to ride along on an actual sting. Everything went swimmingly. Perhaps too much so, as Crooks was first surprised at how quickly the action developed (there was no need to wait around all day with the hopes that something would happen); at the seeming lack of concern over being spotted; and the taking of the ‘victim’s’ car by the client without a resolution. Crooks’ suspicions had him hesitant to write the personal interest story the Butler hoped would be good PR for his reality show. Although there is the opportunity to write this like a true-crime mystery novel, Crooks take a more direct/reporter approach and lays out the facts as he sees it and he often falls into fortune more than actually ‘uncovers’ anything. An anonymous ‘tip’ comes to Crooks from someone within Butler’s organization, and it is the constant insight from the insider that lays the foundation for a federal investigation. Yes… a federal investigation. Not because Butler is possibly providing phony investigations for a television series, but because Butler has other, illegal dealings going on, which also include high-ranking police officers. Crooks is tossed into the middle of all this, but steps aside to let the lawmen do what they need to do, while the insider continues to inform to both the authorities and Crooks. Crooks, early on, lays out his suspicion as to the ‘insider’ and repeats it a few times. Perhaps I’ve read too many fictional mystery books, but this immediately had me thinking that it would NOT be the person Crooks suspected. It was a bit disappointing that Crooks nailed it straight off. But what is almost as interesting as Butler’s sting and fall, is Crooks’ relationship with the insider. Crooks lays it on just a little bit thick that he looked upon his informant almost as a friend (it was Crooks the insider went to for help finding a trustworthy law official) so that when the insider later ‘bashes’ Crooks’ role in the set-up, Crooks can’t help but be hurt. Crooks also carefully points out that the insider’s motivations for doing the right thing are suspect and that the insider is barely ‘better’ than Butler and the bad cop. Yes…I am not naming the ‘insider.’ No…it is not because I am avoiding ‘spoilers’ but because it is my impression is that the informant is a fame junkie and I don’t think this person needs to have their name out there, searchable, any more than possible. This is a fascinating book on many levels. From a study in human behavior to a modern mystery to an insider look at reality tv, this book has a lot in it and is easy to access. Looking for a good book? 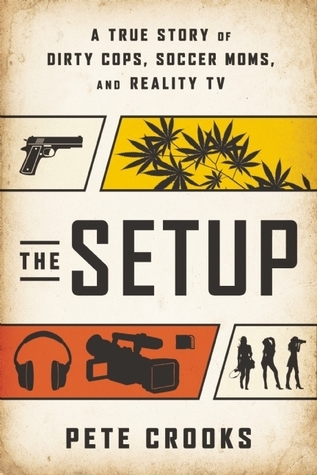 The Setup is a non-fiction book that you will not want to put down. You do such a disservice by not providing examples how the famewhore tormented Pete.